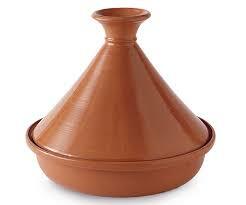 If you enjoy trying international cuisine, then invest in a tagine. 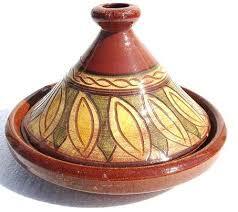 A Moroccan tagine is a two part cooking vessel that traditionally is made of clay or ceramic. It has a cone shaped top. Tagines are used to cook stew like dishes. Part of the fun is that tagine recipes can be very easy to prepare and cook. Once you stock several spices frequently used in the recipes (turmeric, ginger, cinnamon to name a few), the ingredient list can be pretty simple. The main part of the stew can include beef, lamb, chicken or fish. Fruits are usually part of the dish….prunes, dates, dried apricots. You can also prepare vegetarian dishes. Another reason why cooking with a tagine is easy...only one pot. You don’t need any other special kitchen equipment or other pots or pans. Besides making for a unique looking piece of cookware, the cone shaped top serves a practical purpose. The lid ensures that heat condenses at the top so that the dish does not dry up even if left on the stove overtime. When your family or friends come into the kitchen, they’ll know a tagine meal is in the works. There is a tiny hole in the lid to let out some steam and it fills the air with the wonderful smell of the spices used in tagine recipes. 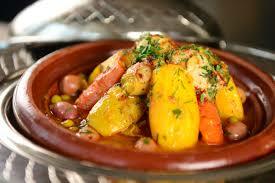 Back to easy….tagines are very attractive. They can be plain or come in a variety of colors and painted patterns. As a result, remove the lid and bring the meal directly to the table as the bottom serves as an attractive serving dish.